Our next meeting will be at 7.30 p.m. on Monday 10 September. At that meeting we will be presenting ‘work in progress’ from our ‘Lewes Streets’ project. The plan is to include three short talks about three very different Lewes Streets, Toronto Terrace, Station Street (formerly known as St Mary’s Lane) and Eastport Lane in Southover. 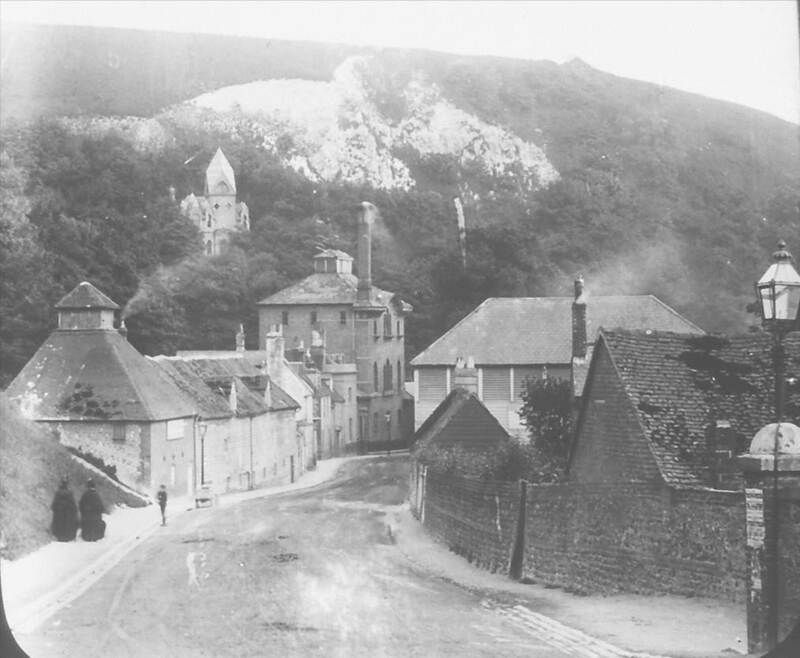 This view down Malling Hill was taken on a glass negative by Ringmer photographer Frank Burgess, probably c.1891. 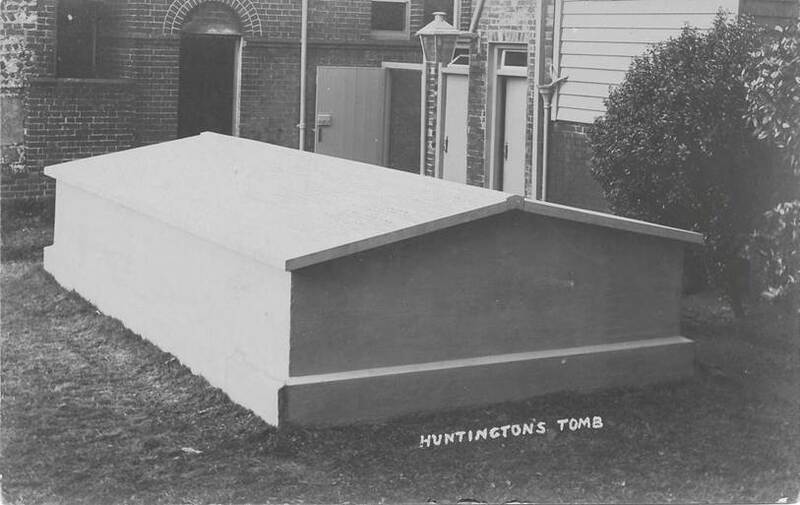 Source: Ringmer History Study Group image P504. The Chancery records note that the King’s escheator in Sussex was ordered on 20 July 1366 to ascertain the rights and property of the South Malling college of canons. After a hearing held in Lewes on “the Tuesday after St Lucy”, his return, translated into English, was as follows. “The dean and three canons of the collegiate church of St Michael, Suthmallyng, have time out of mind had four manors or dwelling places with their gardens, 13 acres 1 rood of land, 11 acres of meadow and a piece of marsh lying on the bank opposite their gardens in demesne in Suthmallyng. They hold the town of Stanmere with those of Lyndefeld Archiepiscopi and Burlegh; and have many tenants in Lyndefeld, Burlegh, Mallyng, Welyngehamme, Ryngmere, Middelham, Glynde, Clyve, Lewes, Baldesden, Stanmere and Wyvelesfeld and elsewhere, belonging to their deanery and prebends, owing suit of court every three weeks in Suthmallyng, some owing rents, some of those in Stanmere and Baldesden being bound to be reeves at Suthmallyng and Stanmere, some of those at Lyndefeld being bound also to be beadles when elected, and many to mow, carry and do other customary services. The said dean and canons have held all the foregoing except the meadow in pure alms within the fee, demesne and liberty of the archbishopric. All their said tenants hold of them at will, except a few who have charters under the common seal of the said dean and canons to hold by free services, and a few others who have so held time out of mind. The dean and canons have time out of mind taken all amercements of their tenants, both in view of frank pledge and in the courts of the archbishop and other lords, except amercements imposed at the assize of bread and ale or in the eyres of justices or in other courts of the king. They also take fines and forfeited issues both in eyres and other courts of the king, chattels of their own tenants when felons or fugitives, escheats of such tenants when they occur in the said towns, and waifs, strays and other forfeitures when they occur in their tenure and demesne. Also in all the lands of the archbishop and his tenants at Stonhamme, except parks, and in a chace called the chace of the dean and canons of Suthmallyng near Horlockescrouche and Raychchesgate in Claris, and in all their own lands and those of their tenants in the said towns, they can by ancient custom take and carry away all game and other beasts of the warren whenever they, or any of them, please. Also by right and custom they have all the tithes of the manor of Stonhamme, both great and small, the great tithes of the parishioners of Ryngmere and Mallyng, the tithe of pannage, both pigs and money, in all the woods of the archbishopric in Ryngmere, Fremfeld, Bocsted, Uckefeld, Maghfeld and Wadehurst; they have 24 pigs yearly, i.e. 6 each, in the archbishop’s park of Broyl in time of pannage, quit of pannage, agistment or other payment; 16 oxen, i.e. 4 each, going and grazing with those of the archbishop wherever they graze throughout the summer, and so long as the archbishop’s oxen graze there, quit of agistment or other payment; common for all their beasts without stint in the Broyl and in Suthmallyng, like other tenants of the archbishop; 4 oaks every year, i.e. one each, tall and fit for fuel, in the Broyl; two fairs a year at Lyndefeld, one on St Philip and St James’s day and the week following, and the other on St James’s day and the week following; and a market every Thursday at Lyndefeld, with all liberties and free customs to such fairs and markets belonging; and certain yearly pensions from the vicars of Fermfeld, Ryngmere and Clyve. The prebendary of Maghfeld is bound to bear all charges of the collegiate church of Suthmallyng, including repairs of the church, belfry, cloister, churchyard and ornaments, together with the dean and three canons. The church of Lyndefeld, with the chapel of Shoteneber, the dwellinghouse and other buildings, lands, woods, mill, tithes and other revenues, wardship of tenants, and the best beast at their death or last illness, is appropriated to the dean separately. According to the Victoria County History article on the college, it was endowed with land in Stanmer, Lindfield and Burleigh as early as the 8th century, but its possessions and rights within the archbishop of Canterbury’s manor of South Malling were probably added on or after its re-establishment by Archbishop Theobald in 1150. The archbishop held the Mayfield prebend. Sources: Calendar of Miscellaneous Inquisitions (Chancery) vol.III, p.228 no.615; Chancery miscellaneous inquisitions file, 190, 17. The Latin text is reproduced in Sussex Archaeological Collections, vol.21, pp.159-163. Victoria County History of Sussex, vol.2, pp.117-119. 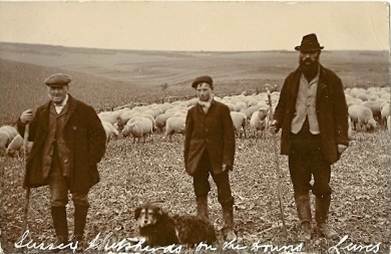 This James Cheetham postcard features a trio of shepherds, a flock of Southdown sheep and a rough haired sheepdog of the type then commonly used. It was posted in 1910. Mr. and Mrs. Arnold and their sons lived in a house mid-way along Evelyn Rd on the Landport Estate. Mr Arnold had fought in France in The Great War and fired our imaginations with his stories of trench warfare. Having decided to breed rabbits for sale and to eke out the meagre meat ration, he built a number of wooden hutches and these adorned various sections of the back garden. His carpentry skills were also employed in making toys. In the evenings he liked to listen to the wireless from the comfort of his fireside chair whereas the stout and jovial Mrs Arnold relished her nightly trips to the Tally Ho public house nearby. The youngest son, Gerald, was about the same age as Maurice and still at school. An older son worked as a baker’s roundsman for the Co-op and Maurice used to help him on his Saturday round. Apart from the duties of the round itself, this involved a trip to the stables, located behind the shop, to muck out the horse. Two other sons were in H.M. Forces. Life at Mr and Mrs Arnold’s was fairly uneventful but Sundays were memorable because suet pudding seemed always to be a feature of the mid-day meal. A thick, elliptically-shaped, white slab of suet pudding would appear in the gravy accompanying the roast or, failing that, with some kind of sauce for ‘afters’. Sometimes in the meal-time conversations I gained the impression that Mr Arnold thought me slow-witted because I asked those childhood questions that are bound to baffle adults, such as. If God made the Earth, who made God?’. During our stay Mum decided that she no longer wished to be parted from her boys so she came down to look for lodgings near us. She happened to mention this when she visited a shop at Landport run by Mrs Dodman, who then agreed to take her in. A short time later we three boys moved in with her. There would be no more long anxious periods spent by the weigh-bridge, just inside the main door of the railway station, waiting for our parents to appear at the barrier leading to the platforms, on the days they came to visit us on trains delayed by air-raids. Mrs Dodman was an elderly, white-haired, bespectacled widow to whom age had not been kind. A pronounced stoop added to her frail-looking appearance and her hands were bent and twisted by arthritis. She had once owned an off-licence in Walthamstow but had moved with her daughter to Lewes in 1937 when she had bought the grocer’s shop on White Hill that had been so close to Miss Hunter’s house on Castle Bank. As part of a proposed council-redevelopment scheme that shop had been demolished shortly after we left Miss Hunter’s house and Mrs Dodman had moved to new accommodation at the corner of Lee Rd and Bridge Green. The premises comprised a house and two adjoining shops with a connecting door. One of the shops was used for selling groceries while the other, its windows whitened, was used as a stockroom. Mrs Dodman occupied the downstairs front room of the house and the main bedroom. She needed no more space as her daughter was, by then, engaged in war work in a Slough factory. Mum and we three boys occupied the back room downstairs, which included shared kitchen facilities, and the other two bedrooms. In the beginning, Mrs Dodman was somewhat guarded with her new ‘family’ so when Mr Churchill gave a speech on the wireless we were invited to listen to it standing outside the door of her room, rather than in the room itself. However, as time passed the relationship grew more relaxed and she came to assume the mantle of a grandmother rather than a landlady. She told us how Lewes had been before the war, about the assizes, the crowds of people on race-days and the splendid costumes of the Zulu warriors and Red Indians in the torch lit processions of bonfire night. Mrs Dodman’s life centred around the shop and she did her best to please her customers. That included selling cigarettes two or three at a time to the hard-up wives of those who had gone away to war and being discreet with gossip, though she was generous in passing on snippets of news gleaned from reliable sources such as Mr S. He was the chief air-raid warden of the town and lived next door. In his morning visits to the shop, to buy some pipe tobacco or some other small item, he would chat to Mrs Dodman about air-raids that had taken place the previous night in the Sussex area. On Saturdays and during school holidays, Maurice helped in the shop. Apart from serving customers from the small section of counter not occupied by the glass display cabinets, a set of scales and the bacon-slicer, this involved counting up the variously lettered coupons cut from ration books and sorting out the jumble in the stockroom where cartons of toilet roll fought for shelf-space with boxes of soap, cases of tinned vegetables and bottles of Paraquat. In the next school assembly, Mr Bowley asked for the boy who had knocked Councillor P off his bicycle to step forward but the guilty person was not present. The accident was strangely coincidental. Mrs Dodman claimed that before moving to Landport she had been given to understand that hers would be the only grocer’s shop on the estate and was aggrieved when a shop owned by a certain Councillor P, and run by his son, opened up at the other end of Bridge Green selling grocery items. Our lives at Mrs Dodman’s took on a comfortable routine. On her days off, Mrs Dodman liked to be taken out. She relished her visits to Holloways, near the White Hart Hotel, for a silver-service tea and enjoyed occasional trips to Brighton with us. She was present when I won a basket of fruit in a raffle at a garden fete held in the grounds of Glynde Place. In out-of-school hours, Ronald sang in the choir at St John’s-Sub-Castro and Maurice built model aircraft, some of which were exhibited in the window display of a High Street shop. I spent my spare time in the company of Robbie who had moved with his parents to a new house in Pellbrook Rd. Nearby, somewhat later, German POWs worked on some allotments. One day I was informed that I had done sufficiently well in the Scholarship Examination, which I had taken with others sometime previously, to go to a ‘Central’ school. That was a surprise because I had not paid much attention to schoolwork and my reading had been confined largely to the popular comics, ‘Beano’, ‘Dandy’, ‘Adventure’ and ‘Hotspur’. In the spring of 1942,I left Lewes to go as a boarder to a school in Crowborough that had been evacuated from Croydon, but each Friday afternoon I took the train back to Lewes for the weekend. The list of stations read like the last line of a prayer; Crowborough, Buxted, Uckfield, Isfield, Barcombe Mills, with Lewes as a concluding ‘Amen’. As the engine puffed its way across the bridge over Lower High Street, past familiar landmarks such as The Tabernacle Church and the Library I knew I was ‘home’ once again. At weekends I was told about things that had happened while I had been away. These included the burning-out of an English bomber that had crashed just off the Offham Rd and Maurice’s diving for cover in a Station Street pub, despite being under-age, when a German aircraft swooped low overhead, its guns blazing as it strafed the town. 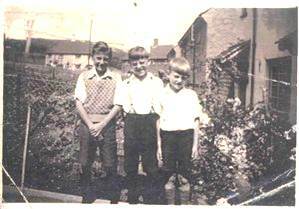 In 1943 my school moved back to Croydon and Mum and my brothers moved back too. Our evacuation to Lewes was over, but our links with the town were to persist. However, that is another story…………. 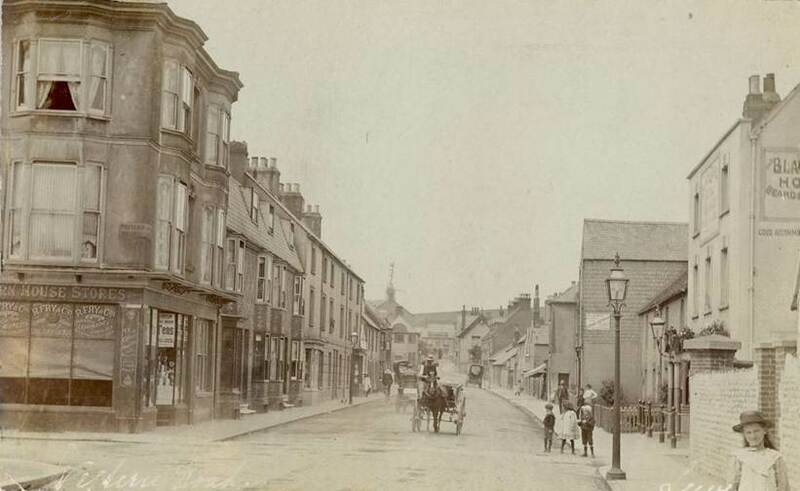 Truly a photo from another age – I particularly like the children in the road outside the Black Horse pub who are distracted from their pose by the approach of the horse and cart. 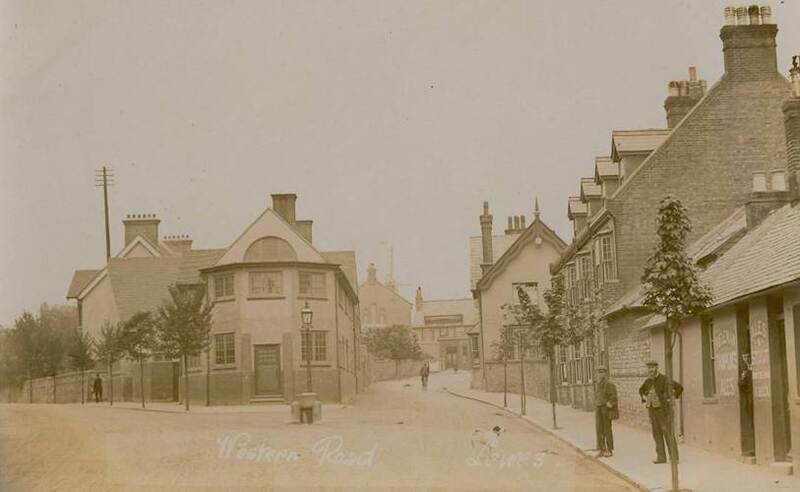 The shop on the left is Western House Stores, with the name H Roberts (I think) above the door. The side windows are given over to advertisements for: R Fry & Co – Lemon Squash, Lime Juice Cordial, Ginger Beer, Lemonade, and Ginger Ale. The advertising board on the cottage across the street appears to read ‘Messrs Kennard’, but I can’t make out any other detail. Further up on the right hand side is the Rifleman pub, and facing down the road is the Windmill Inn. The rather ramshackle looking Rifleman pub on the right, and the “Arts & Crafts” building currently at the heart of a planning battle, presumably seen here in its prime. Further on the Windmill Inn can be seen facing the camera, with the end of the Prison beyond, and Shelly’s windmill sails rising above. On the right hand side there is a large building “Astley House” which was presumably the house of the racehorse trainer. Images, courtesy of Linda Weller. This entry was posted in Art & Architectural History, Biographical Literature, Ecclesiastical History, Lewes, Local History. Bookmark the permalink.